Sigh. That's what makes the job hard: all the really good ideas are taken. 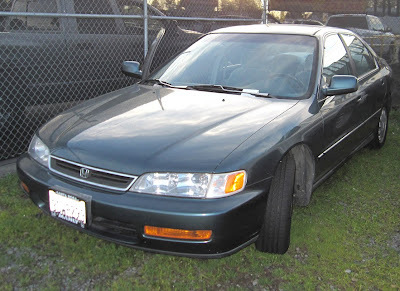 Loyal friends o' the blog may recall this post from last November describing how my family's venerable '96 Honda with 206,000 miles on it was taken from in front of my wife's office one afternoon. 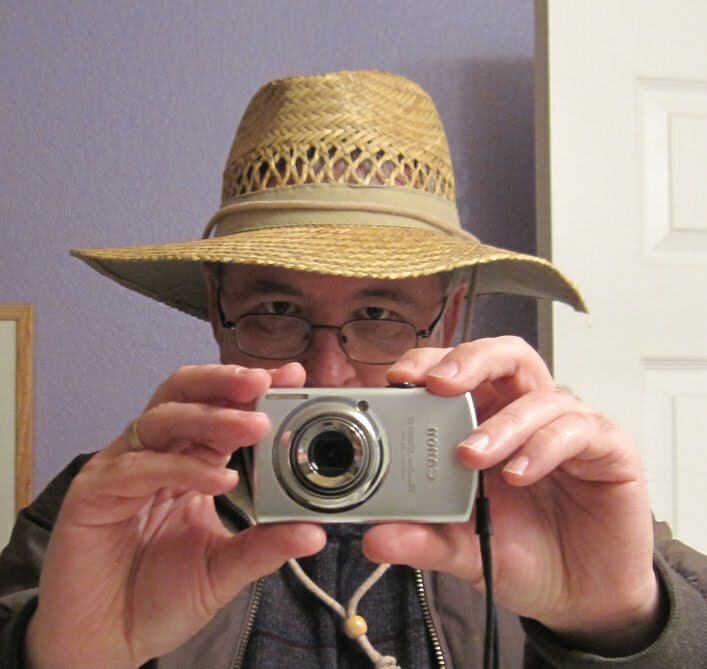 My jaunty opening to that post was a complaint that my favorite hat had been stolen and, oh, by the way, so had the rest of the car it had been in. We grieved. Not like you do when something (someone) real has been lost, but like you do when the car you raised your kids in and hoped to maybe hand down to them and never had a chance to say goodbye to has been lost. Insurance declared it "totalled" and paid us off--honestly, more generously than we expected. We bought a new car with high-tech 21st Century features we enjoy. And a few days ago the cops called and told us they'd found and impounded our car. Never expected that. Old Hondas are chop-shop favorites, and we figured she'd been dissected before we even noticed she was gone. It turns out she probably spent the last couple of months abandoned in the parking lot of a fitness center less than two miles from home. The police told us she looked to be in pretty good shape, "except there's a lot of garbage inside." We assumed that meant totally trashed. We called the insurance company, which actually owns the car now (and already took possession of the keys), to ask "Now what?" They said they'd truck it to a distant salvage yard. "Fine," we said, "but could we take a look first? Maybe see if there's the slightest chance any of our personal property is still inside?" "Sure, but do it today because we're transporting it tomorrow." Karen and I dashed down to the tow yard with the paperwork proving we used to own the car. The tow yard guy was sympathetic. We didn't have a key but we still had a remote that unlocks the doors. It worked. Score! All that garbage inside? It was ours, scattered: maps, paper napkins, owner's manual from the glovebox. It's almost a sitcom gag. ("You've been robbed!" "No, it always looks like this.") Except for some damage done as the thief tore through the interior looking for valuables, the car looked good. Real good. If we'd had the keys we could've driven her home. The iPod and GPS were gone, of course, as were Karen's good sunglasses. But everything else--everything--we'd left in the passenger compartment and trunk was still there. All the registration papers I feared someone could use to find my house. The garage door remote I feared they could use to break into it (if I hadn't immediately reprogrammed the opener). And my dorky straw hat. I think it's possible in these situations to buy your recovered car back from the insurance company, but we never really considered it. It would have cost more than the car was worth. Frankly, just paying the towing company for towing and storage would have cost more than the car was worth. We have a new car, we've moved on. But we got to collect our stuff, bang her on the hood, and tell her thanks and goodbye. That's worth considerable peace of mind. Farewell, our true and faithful steed. This post won't be everyone's cup of tea. Each year, the online salon "Edge.org" asks the smartest people it can find a different Big Question. Earlier years' questions have included "What have you changed your mind about," "What are you optimistic about," and "What do you believe is true even though you cannot prove it?" This year's question asked them to name their "favorite deep, elegant or beautiful explanation." The responses are profound, trivial, thoughtful, silly and incomprehensible. Most are worth mulling over. One person chose the Scientific Method, calling it "an explanation for explanations." I like that. A few chose Einstein’s explanation of gravity as the curvature of spacetime. More biologically inclined respondents picked the DNA double-helix. Other answers included behavioral economics, sexual conflict theory, "Like Attracts Like," Pascal's Wager, plate tectonics, the germ theory of disease, or how the experience of time changes when one stops wearing a wristwatch. For example, I'm amazed how often trigonometric functions like sine and cosine appear in unexpected places. It's not surprising when they crop up in systems of a cyclic nature; for example, the motion of any spot on a rolling wheel describes a sinusoidal curve. You'd expect to see them when calculating a planet's orbit or electron's path. But they also appear in weird places that have nothing to do with circles or angles, hinting that they are deeply woven into the fabric of the universe. In any event, why should math--an internally consistent system of analysis and calculation invented by humans--describe reality at all? Yet it does, to as fine a point as we can measure. Moreso, it sometimes seems that no result from mathematics is so wacky or abstract that some scientist can't find an unimaginably small, large, fast, dense, early or late chunk of the universe that it describes perfectly. I'm amazed by Euler's Identity: e^iπ + 1 = 0. In this equation, "e" is Euler's Number, (1 + 1/n)^n as n approaches infinity, equal to 2.71828... ; π is the ratio of a circle's circumference to its radius equal to 3.14159... ; and both are transcendental numbers that never end. They have nothing in common. Yet if you take "e" and raise it to the power of imaginary π (that's what the "i" indicates) then add 1, you get 0. To my ear, that's like saying "if you stack crushed glass and Pop-Tarts on top of a Stephen King novel, you get fried chicken." It makes no sense but there it is, again hinting at a deeper truth I can't begin to comprehend (not least of which is the notion that imaginary numbers--multiples of the square root of -1, which makes no sense in real life--actually mean something). I think Newton's insight that Force = Mass x Acceleration (F = ma) is THE pinnacle of human intellectual achievement, real Promethean napalm. It's not intuitive or obvious, and yet the most profound insights and results flow from it. First, it implies that objects only feel a force when they accelerate or decelerate (which includes changing direction, and was stated more colloquially by Newton as "an object in motion tends to stay in motion, an object at rest tends to stay at rest"). To put it another way, it's not jumping off the cliff that kills you, it's the sudden stop at the bottom. F = ma makes the tides rise and the planets spin. It took me a couple of years to really grasp the profundity of F = ma and I can't recapture that learning in a brief blog post. Suffice it to say that F = ma is nearly all you need to know to shoot a rocket into space and land a man on the Moon (although it wouldn't let you build a GPS satellite network, which requires the refinement of relativity). Studying that equation changed the way I regard the world. Also deep, elegant or beautiful: the idea that a profound insight into the universe can be expressed at all, let alone economically with only four or five symbols. F = ma. E = mc^2. Maxwell's Equations, which in the late 19th Century explained the entire field of electromagnetism (and, incidentally, could be solved to prove E = mc^2 although no one realized it until Einstein achieved it a different way decades later), are four expressions that can be written with 30 or so symbols. One of the great quests in science is for a Grand Unified Theory (GUT) that would unite General Relativity and Quantum Mechanics, which govern different realms (the very big/fast and very small, respectively) and are currently incompatible. No one quite knows what a GUT will look like, but I remember one researcher saying he'd know it when he saw it because it'd fit on a t-shirt. That seems right, doesn't it? That when we eventually find the universe's owners' manual, it'll comprise one page with a single line of type (or, per Douglas Adams's Hitchhiker's Guide to the Galaxy, the number "42")? There's no reason our aesthetic sense of elegance should coincide with how the universe actually operates--the universe doesn't owe us simple answers--but so far that's how it seems to work. That's deep. However, none of these are really "explanations" in the sense the question asks. They may be helpful tools or Mysterious Mysteries of the Unknown, but they don't really explain anything. So for my favorite deep, elegant or beautiful explanation I'm going outside Physics to Darwin's Theory of Natural Selection. The reason it's my favorite is that when I first learned about Evolution it seemed so self-evidently obvious to me that I couldn't believe it hadn't always been common knowledge. No math required. Lifeforms with characterstics that offer advantages in a particular environment live to reproduce more successfully than those without them. Different environments reward different characteristics. That's it. Repeat for a couple billion years and it explains everything from the oldest fossil strata to the latest flu vaccine (we wouldn't need a new flu shot every year if the bugs didn't keep evolving). That's just common sense! Why didn't everybody know that all along? We needed Darwin to tell us that? But of course we did. Physicist Richard Feynman once posed the question, "If all of scientific knowledge were to be destroyed, and only one sentence passed on to the next generation of creatures, which statement would contain the most information in the fewest words?" Feynman's answer: "All things are made of atoms." That's a pretty deep, elegant and beautiful answer. Another book review! But one with two caveats up front. 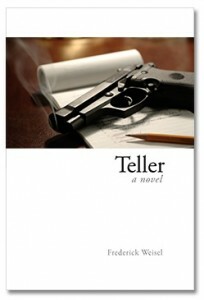 Teller: A Novel may be the only murder mystery I've ever read aside from Sherlock Holmes. It's not a genre that normally appeals to me, and I'm a blank slate when it comes to its traditions and tropes. In addition, the book's author, Frederick Weisel, is a friend and former boss of mine. We get together occasionally to share tall tales of the literary life over lunch. I watched him struggle to write this thing over many, many months. Between that and my ignorance of detective fiction, it's impossible for me to offer an informed, impartial review. Instead, consider this an appreciation of story I was thrilled to read at last. Charlie Teller is a ghostwriter of best-selling celebrity autobiographies whose excesses destroyed his marriage and career. Now he's moved to the Wine Country of Sonoma County, California, to be near his divorced wife and daughter, accepted a job to write the vanity-project biography of a construction mogul, and made new friends, one of whom quickly turns up dead. Teller is the first on the crime scene. Feeling an obligation to the victim, he starts his own investigation. That's what an autobiographical ghostwriter does, right?--ask questions, probe acquaintances and enemies, and gradually illuminate the mysteries of a life. A tough cop, the victim's femme fatale fiancee, a special forces vet, a paranoid drugged-out rock star, and other characters have their own secrets and agendas. Some want to help Teller; others want him dead. Teller is a reluctant hero, not particularly strong or capable, but driven by a dogged curiosity. The mystery moves along and builds to a satisfying conclusion, with a fine mix of action and dry wit. Weisel brings a lot of nice texture to Teller's world. He's done his homework on literature, classical music, winemaking. Setting the book in the county Weisel and I both call home gives it a terrific sense of place. I know these restaurants, hotels, backroads and vineyards. Again, he gets the details right (except I've never run into as many rich and famous celebrities as Teller does, but maybe I go to the wrong parties). Interspersed throughout the book are flashbacks, set in a different typeface, that relate the rise and fall of Charlie Teller's literary career. I'm told that at least one early reader didn't like these chapters at all, arguing that they don't advance the plot or help solve the mystery. I couldn't disagree more. I appreciated learning the arc of Teller's life, from struggling young writer to rising star to the humiliated failure we meet on Page 1. We encounter some terrific characters, learn Teller's strengths and weaknesses as a writer and man, and understand how desperately he needs this job--or something in his life--to work out. For me, the threads elegantly come together. Just as Teller wrote his subjects' life stories, Weisel has written Teller's. I loved the flashbacks, and honestly thought they elevated the entire novel above what could have been a routine murder mystery (noting, as I did above, that I don't really know what's "routine" for this type of story). I can't sum up Teller better than Weisel himself did on his back cover. I found it "a surprising novel about the meaning of memoir and the stories we tell ourselves about who we are." It's a fun, ambitious first novel from an author who I hope will do many more, and next lunch pick up the tab. I learned a couple days ago that the LitGraphics traveling art exhibition, of which eight of my original pages from "Mom's Cancer" are a small part, is coming to the Munson-Williams-Proctor Arts Institute in Utica, N.Y. March 4 to April 29. This is the comics art show I write about from time to time that was originally mounted by the Norman Rockwell Museum in Stockbridge, Mass. in 2007. I attended that opening, as I did its opening at the Toledo (Ohio) Museum of Art in 2009. Since then it's been to the James A. Michener Museum in Pennsylvania and the Fitchburg Art Museum in Massachusetts, where Friend O' The Blog Jim O'Kane made the Best Video Ever. Now New York. I can't believe my drawings have been out traveling the country for more than four years. They grow up so fast. But would it kill them to call once in a while? The Munson-Williams-Proctor people have asked me to record a one-minute audio clip discussing my work, presumably for museum-goers to hear as they browse. It's tempting to read a recipe out of a cookbook, record a cat howling, or just unleash a profanity-laced tirade. Sadly, I'll probably play it straight. That's why I'll never be a great artist. LitGraphic is a terrific show if you can get to it. Eisner, Crumb, Spiegelman, Kurtzman, Ditko: more than 200 works of great comics art, plus eight of mine. Worth your time. One perk I really enjoy is that from time to time Editor Charlie sends me an Abrams book he’s particularly proud of or thinks I’ll appreciate. A few weeks ago he mailed me a review copy of My Friend Dahmer (Abrams ComicArts, 224 pages), a graphic novel by Derf Backderf, which will be released in the spring. I don’t often review books; however, for reasons I’ll explain, My Friend Dahmer stirred me to reflect and write. My Friend Dahmer relates cartoonist Backderf’s high school relationship with serial killer Jeffrey Dahmer, who killed 17 men and boys between 1978 and 1991, when he was caught after his intended 18th escaped and ran half-naked into the street. Dahmer was especially depraved, torturing his victims horribly and eating some of their remains. He was killed in prison in 1994. Backderf knew him in high school before the murders started (coincidentally, Dahmer claimed his first victim the same day Backderf moved to college) but long after it was clear there was something desperately wrong with Jeff. Backderf pulls together clues whose significance was only obvious in retrospect: a preserved fetal pig stolen from the science lab, animals found butchered in the woods, weird laughter at a friend who fell and hurt himself. Backderf wonders why no one—parents, teachers, cops—connected the dots. A haunting subtext of the story is Backderf brooding over why he didn’t, either. My Friend Dahmer is no apologetic. Backderf never asks or expects us to sympathize with a monster. 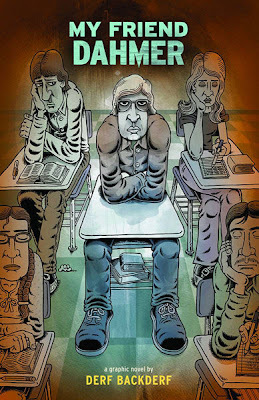 But he does illuminate how Dahmer got broken, partly through common high school hurts and humiliations that Backderf recalls with aching clarity. Dahmer, Backderf and I are evidently peers—I graduated high school the same year they did—and though I didn’t grow up in Ohio, Backderf’s portrayal of the clothes, cars, classes, and most importantly the feel of the times really resonated with me. I had that haircut, I wore those glasses. I had those friends. Does My Friend Dahmer work as a comic? Honestly, I had to give the question some thought. Backderf’s drawing style owes something to MAD Magazine’s Don Martin, one of the great big-foot, over-the-top humor cartoonists but maybe not your first choice to illustrate a serial killer bio. I initially found the contrast between form and content jarring. However, upon reflection, I thought it succeeded. Backderf’s storytelling is skillful and clear. Sometimes, his style lets a little lightness into a story that is otherwise unbearably grim. Other times, particularly through Backderf’s thoughtful spotting of black, the art effectively builds suspense and dread. Ultimately, despite (or due to?) its cartoony grotesqueness, My Friend Dahmer is an impressive work of journalism that may well stand as the most sober and thoroughly researched biography the killer ever receives. In endnotes, Backderf discusses his sources, including FBI interviews obtained under the Freedom of Information Act. Backderf tests his first-hand memories of characters and events against later evidence and timelines, points out where they agree and diverge, and clearly annotates nearly every page. It’s a nice piece of genuine scholarship. Now: why My Friend Dahmer hit me in a way it may not hit you. As I said, I’m the same age as Backderf and Dahmer. I didn’t attend my high school class’s 25th reunion, but its organizers invited everyone to write short bios that were compiled into a booklet and, months later, mailed out to us. I sent in a paragraph. Everyone who contributed anything sent in a paragraph. Everyone except one man, who sent in three single-spaced pages chronicling a lifetime of depression, victimization and misery. He concluded by wondering what he might have done to all of us if only he’d had the example of Columbine to inspire him. Well. That gets you thinking. I knew him in school and considered him a friend. He was a bit “off,” not in a scary way but enough to ping the radar of the predators and bullies. No kid I knew—whether punk or stoner or nerd or gay—was lonelier or had a bigger target on his back than this boy whose raw howl of defiant rebellion was wearing a suit and tie to school. Even the teachers just rolled their eyes. I knew his high school years were hell. I’m pretty sure I didn’t do anything to make them worse, but I don’t know if I did enough to make them better. That’s a regret I imagine Backderf shares. My friend was no Dahmer. But then, when Backderf knew Dahmer, neither was Dahmer. My Friend Dahmer concludes with a chilling coda set in 1991, when a friend of Backderf’s called to tell him that one of their classmates had been arrested as a serial killer. The friend asked Backderf to guess who it was. Dahmer was his second guess. That gets you thinking, too. I could think of no better way to begin 2012 than embarrassing my children. I was in my wife Karen's office recently when I saw one of my three favorite family photos of all time stuck on the side of her file cabinet and had to grab, scan and post it. I love everything about this photo, which makes me very happy everytime I see it. In 1996, my 8-year-old twin daughters were in a Brownie Girl Scout troop led by Karen. The girls in the troop ended their school year and began summer vacation with a party that included an apple-bobbing tub. My daughter Robin took her turn, captured her apple, then stepped aside for her sister Laura, and . 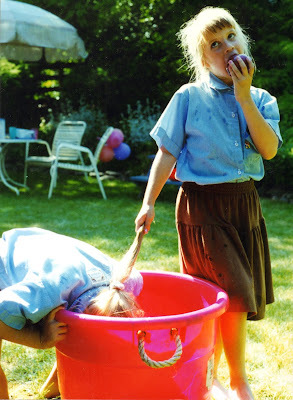 . .
What's the point of having a twin sister if she won't help keep your ponytail dry? Is that a Norman Rockwell painting or what? Honestly, though I'm ashamed to admit it, I wasn't sure which girl was which in this photo. I asked the girls themselves (while asking their permission to post it) and they replied, "How should we know?" Karen IDed them as above. Personally, I would've deduced that the hair-holder was Laura based on the left-handed apple-eating (Laura is left-handed, Robin right-handed). But Karen says she's 99% certain, and when in doubt you've gotta trust Mom. These are problems most people don't have when looking through family photo albums. In any event, my girls still have each other's backs 15 years later, which is one of the things about this picture that makes me happiest. Happy New Year, chiquitas.